Veater Ecosan: "The World About Us": Tucker: Would war against Assad make US safer? Why is America so blood thirsty? Especially when it is Arab blood....? "Leaders on both sides of the Isle in Congress, in the media, in our Intelligence Services, and virtually every over-funded Think-tank in Washington, have suddenly aligned tonight on a single point of agreement: America must go to war in Syria immediately! " This thing has been a long time in the oven. A few years back when Cameron's plan to attack Syria was blocked by the British Parliament, I commented that the whole ISIS thing was just a ruse to allow attacks into and over sovereign Syrian territory, contrary to international law. You cannot uphold international law by breaking it! The 'Syrian Uprising', like those that preceded it elsewhere, was largely Western inspired and promoted, on the back of the Neocon/Zionist agenda, kicked off by the criminal fraud of 9/11 that has never been admitted or prosecuted. As long as Western Governments continue to deny the truth about these events - indeed Cameron wanted to make illegal any suggestion it was not as officially described - we may be sure that it is all driven by a deep dark agenda, of which the politicians are merely either stupid or corrupt mouth-pieces. There is little doubt the Gouta District of Damascus has now suffered from chlorine-based, chemical attacks with dreadful consequences. The issue is WHO is responsible for them? Sky News appears to be in no doubt. Can Murdoch controlled, and Zionist-supporting, 'Sky' be trusted? It is quite clear that America, Israel and the West wants to blame Assad for them as an excuse to engage in yet another destructive and pointless war. Whilst outraged by the suffering and loss of life, it sees no paradox in arguing for yet more. Undoubtedly as in Afghanistan, Iraq and Libya, tens of thousands of civilian deaths and the chaos that follows such attacks, counts for nothing. Yet again Mrs May's Britain, still smarting over an humiliation over the Skripal allegations, is in the vanguard calling for an "immediate response by the international community" if the claims are proven. Having failed to prove Russian responsibility - even involvement - in Salisbury, this proposition has a certain hollow ring to it. In human terms there is no such thing as a "surgical strike", although the Military want us to believe there is. America and the West is becoming obsessed with killing just so long as it is other people that die. 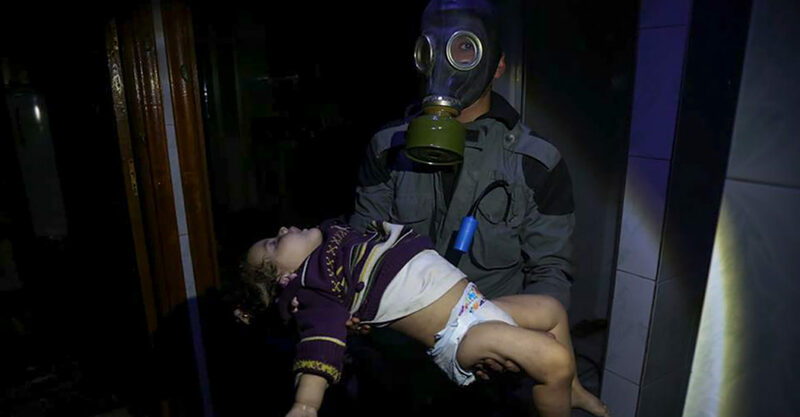 "The regime's history of using chemical weapons against its own people (is) not in dispute, and in fact began with a sarin gas attack in Eastern Ghouta on August 21, 2013 which killed over 1,000 Syrians. "As we've said, Russia ultimately bears responsibility for the brutal targeting of countless Syrians with chemical weapons. Russia's protection of the Assad regime and failure to stop the use of chemical weapons in Syria calls into question its commitment to resolving the overall crisis." The problem is the 2013 incident very much IS in dispute. The sheer stupidity of Assad sanctioning a chemical attack whilst UN Inspectors were on the doorstep, is strongly suggestive it WASN'T him, but rather done by Western and Israeli-backed terrorist opposition groups aligned to so-called ISIS. Note also, also in tune with the current popular anti-Russian meme, Russia is directly blamed. How convenient then that it should also be blame for a "military-grade 'Novichok' nerve agent attack on the Skripals in Salisbury - a story that is falling apart from every angle? This also goes for a chlorine gas attack almost exactly a year ago in April 2017 when more than 80 people were killed in an alleged Sarin attack in the rebel-held town of Khan Sheikhoun -- an attack that prompted the United States to launch 59 Tomahawk Cruise missiles at a Syrian airbase. Syria repeatedly denied it was responsible. Damascus said an air strike may have hit a chemical weapons depot in the rebel-held area. Following that incident, Syria gave up its Chemical weapons stocks under the supervision of America - in fact they were disposed of on an American warship - which is one of the little problems in blaming Assad for the latest incident in Douma, Eastern Gouta, in which dozens are reported to have died. So before America rushes yet again towards dropping missiles onto an already inflamed situation, it should take a long hard look at who is actually creating the the violence and in particular causing these chemical weapon incidents, responsible for so much suffering to human beings. War and its causes we may be assured is a very, very dirty game and with some justification it has been said, that "truth is the first casualty". "The overriding issue of war or peace, survival of mankind or its utter destruction, is now being decided in Washington and NYC without so much as a ‘by your leave’ for the rest of us. Donald Trump has announced very clearly that he will be authorizing some kind of retribution to the CIA-faked chemical attack in Douma, Eastern Goutha in the coming 24 to 48 hours." The Western World has gone completely MAD. This is nothing about chemical weapons. That is just a pretext. The developing action is strategic and personal. Strategic because it attempts to impose Zionist/American hegemony in the region and pursue a long term policy of balkanisation. Personal because America wants to remove and/or humiliate Assad and Putin, both enjoying widespread support in their own countries. The war-mongering May is prepared to kill thousands and destroy yet more infrastucture on the coat tails of a corrupt US regime and on the back of fraudulent false flag chemical attacks. A direct confrontation with Russia doesn't bear thinking about. What has Britain come to? What will it come to if NUCLEAR weapons start to fly? Note the media completely play down the disastrous consequences of further violence. This is intentional because those in control want to avoid a popular uprising against the proposal. BBC pushing WW2 memorabilia and nostalia with the Bomber Command memorial. Everything about this stinks. How many billions will Britain expend on destruction and death when the Government claims there is no money for anything else?